In a good year, I ride a bike somewhere in the neighborhood of at least 3,500 miles. To someone who doesn’t ride at all, that may sound like a lot, but plenty of cyclists ride way more miles in a year than I ever will. But today, I’m not even thinking about the first mile I ever rode. I’ve been thinking more about the very first 20 yards I rode. One of my biking friends and her husband have twins (I don’t need to identify them, because everyone who needs to know about whom I’m talking already does.) Anyway, before those twins turn 6 later this year, they will most likely learn to ride their bikes without training wheels. This seems like a sure thing because the only reason they need the training wheels now is because they think they still need them. Trust me. They do not. But watching them tear around, their training wheels often not even touching the ground, made me recall learning to ride a bike. I must have been around 6. I learned to ride on a girls’ bike. It was red, I think — or, maybe it was just rusty. For some reason, I seem to recall that first bike was a Western Flyer, which was sold back then by Western Auto. But I’m sure my parents bought it used. Neither one of them would have thought spending a lot money to buy a new bike was a good investment of family funds. At some point, my dad took off the training wheels and went to work with me in the backyard. I remember falling a bunch of times — whenever he took his hand off the seat as he ran beside the bike. In fact, my brother, who is 370 days younger than I am, may have learned to ride before I did. Luckily, Dad was always pretty patient and he also liked to laugh. His laughter will be what I always remember about riding a bike for the first time. It was what I heard before I turned around to see he was a good 20 yards behind me and had not been holding on to my bike seat. Of course, I immediately fell over. I’m pretty sure he laughed even harder, then helped me up and got me started again. I had learned to ride a bike — a milestone surpassed only by the first time I rode to the top of the hill. We lived near the bottom of a long hill at the end of a dead-end gravel road. To go anywhere, you had to get up that hill. 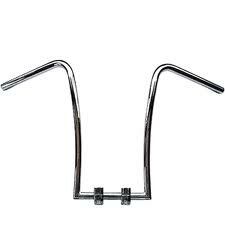 By the first time I rode to the top of that hill without stopping, I had graduated to a boys’ bike with chopper-style handlebars sort of like these. I really liked that bike. It was green. Of course, to ride it nonstop to the top of our hill, I pulled so hard on the handlebars — as I mashed down on the pedals — that eventually one of the handles snapped off in my hand. For the sons of lesser men, this could have been problematic. But it wasn’t for me, because Dad just took the broken handle, ground the busted edges smooth and welded it back on. A few years later, I crashed that bike as I raced DOWN the hill on which we lived, breaking my collar-bone. But that may be a story for another day. For today, if you have any stories about learning to ride a bike or teaching your kids to ride, please share them. I’m pretty sure my friends would welcome the advice. Reblogged this on The Church of Cyclentology. This brought back memories of our mother (who didn’t have patience like your dad) helping my brother and I learn to ride a bike. She finally got so fed up she told my brother, “if you don’t learn to ride this bike on your own, I’m taking your blanket away!” Next thing you know he’s off and pedaling with no help. Oh, he loved that blanket! Bet your chopper handled bike had a banana seat!?! Banana seat … you bet. My parents finally got me a stingray bike with banana seat for my 10th birthday. At 10, I skipped the training wheels, which would have been even more embarrassing than not having a bike until turning 10. I got my daughter a little bike with training wheels when she was 4 or 5. After a few months, I took the training wheels off and took her to an empty parking lot to learn. She insisted on having the training wheels back. They stayed on for TWO MORE YEARS, until at age 7, she was ready to ride without them. The same day, her 4-year-old brother wanted his training wheels off, too. We didn’t have time to teach him how to ride without them, he just jumped on and rode down the street. Before you start to think this has anything to do with boys being naturally better at bike riding, guess which child has ridden RAGBRAI with me — yep, daughter at age 16. The rusty bike part of your story prompted me to respond to this story. As number seven of eleven children in a family that was rich in family togetherness and happiness but cash poor in the early years we always had hand-me-down bikes. My sister Teresa (number ten) was the first in the family to get a new, store bought bike. By then in the early 70’s we were farming 770 acres and the farm economy was good. 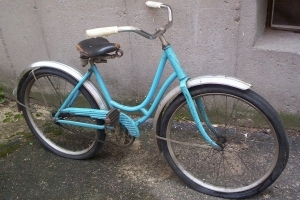 When I was learning to ride, we always had many used bicycles in various stages of repair. My brothers, Richard (number four), who was destined to a career at Stanleys as a mechanical engineer, and Mark (number six) who works at HON in various capacities including engineering, always kept several in the “fleet” ready for action. Good memories.